According to Transparency Market Research (TMR), the global chemical vapor deposition market is demonstrating a competitive and fragmented competitive landscape. ULVAC Inc., Singulus Technologies AG, IHI Corp., Veeco Instruments Inc., Mustang Vacuum Systems, Tokyo Electron Ltd., Oxford Instruments, and Dynavac are some of the key players in this market. These players are focusing significantly on strategic partnerships to eliminate the competition as well as to gain an edge over their competitors, reports the research study. As per the research study, the global market for chemical vapor was worth US$16.4 bn in 2016. Progressing at a CAGR of 7.70% during the period from 2017 to 2025, the opportunity in this market is anticipated to reach US$32.4 bn by the end of the forecast period. Among the product categories, the CVD equipment segment has acquired the leading position and is expected to remain dominant throughout the forecast period, states the research report. 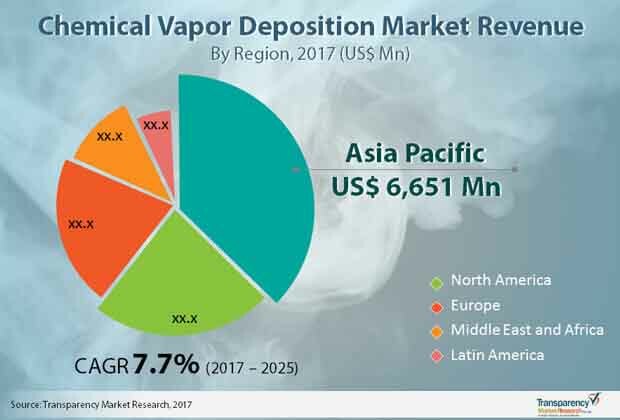 The geographical analysis of the worldwide market for chemical vapor deposition has also been presented in this research study. According to the report, Asia Pacific has been dominating the global market and is expected to continue to do so over the period from 2017 to 2025, expanding at a CAGR of 8.10%. The significant rise of electronics and semiconductor industry is expected to be the key factor behind this growth in the near future, notes the market study. “Chemical vapor deposition (CVD) is finding extensive application in a number of industrial and commercial processes, which is reflecting positively on the growth of the global market for chemical vapor deposition,” says a TMR analyst. The rising demand for CVD in fabricating materials produced by metal matrix composites and ceramics is likely to the support the growth of this market in the years to come, states the research report.